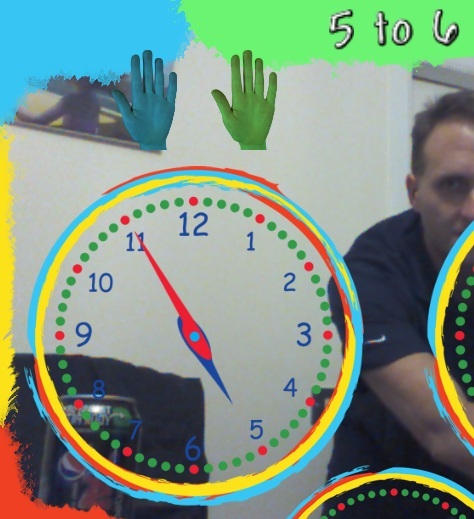 Hot on the heals of my first release comes a minor update to Kinect Time. I decided to release this update after doing a couple minor updates after trying it for the first time in a school last week. It now has two hands which appear, one after you set the hour hand and one after you set the minute hand. This is just to solve the occasional confusion as to whether the hour hand had been set, before setting the minute hand. It also now features two languages, thanks to Stuart Ball at Microsoft PIL for this. In the options.txt file, located in the same directory as the EXE, you can set the language to ENGLISH or WELSH for the WORDS mode in the game (This is shown below). The number in the second bottom line of the options.txt is the angle the Kinect camera is to be set at, you can alter this in the game at the start of each round by pressing the UP or DOWN arrow keys (this works in Kinect Angles also). To download Kinect Time version 1.1 click here. 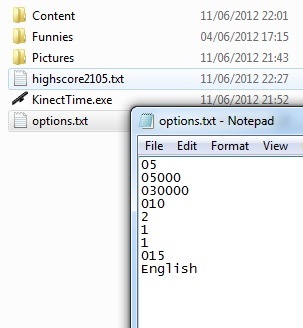 To download Kinect Time version 1.1 with source files click here. hello! is it possible to have the download link with source on another site instead of dropbox? it seems the traffic is too heavy and It is being temporarily disabled..
Yeah I think I’m going to have to move it all to sky drive soon. Go to my most recent post and you will find a link to the source code on my skydrive. I’m a university student living in South Korea. I found your project is very interesting! So, I would like to reference this project in my university paper. Would you mind if I use your project picture and explanation in my paper? I will clarify your picture and explanation sources. That is fine no problem.